My official job title, ETA, stands for “English Teaching Assistant,” meaning that I “co-teach” with a native Indonesian teacher. 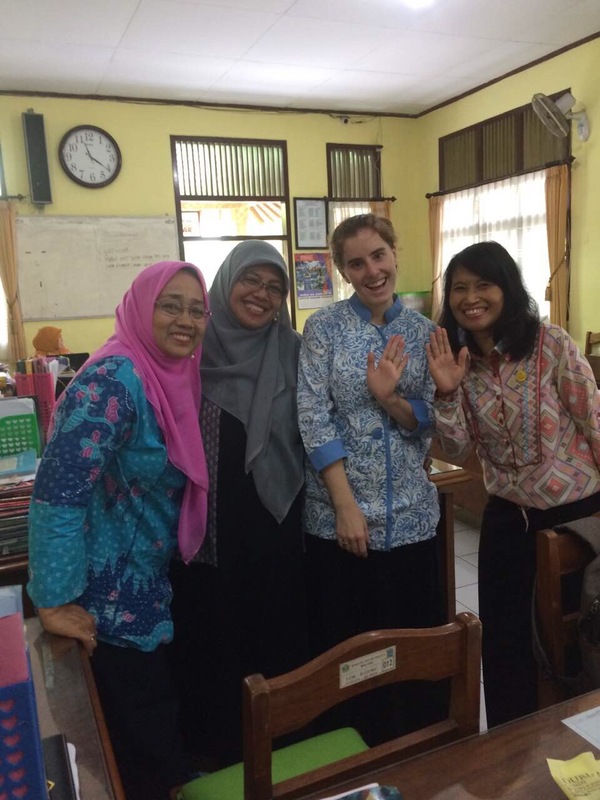 At SMA 2 (SMANDA), I’ve co-taught with four of the school’s five English teachers, but I enjoy spending time with the whole team! In order to co-teach, we plan the lessons together before class, and then during class, we work together to teach grammar, give instructions, practice speaking, etc. In addition to class time, we chat in the teacher’s room, share meals and snacks, and jalan2 (travel) together to various places in Malang and Indonesia. Getting to know this group of people and working with them has been one of the most fun and rewarding parts of my time here so far. Now you can learn a little bit about them too! For these interviews, I gave all the teachers the same questions and then I answered them for myself… Please note that the format of the responses differ depending on whether the interviews answers were given to me or I recorded the answers. Why did you become a teacher: I like learning and sharing to others, and to inspire students because students are the asset of this nation. What is the funniest/best story you have about the ETA you work with? When she teaches, she asks the students to repeat her expressions. An official AMINEF photo of Bu Mamiek and I doing a practice teaching session in Jakarta. We did an activity in which the students were moving around the room and giving and/or explaining their opinions in English. Why did you become a teacher: Because I want to be helpful for people by sharing knowledge. What is the funniest/best story you have about the ETA you work with? Miss Rose is very active talking to the students, trying to make them confident to speak English with a native speaker and it works. I always like it when students enthusiastically ask Miss Rose some questions or when they have a chat with her. What is the thing you are most proud of? My family. Why did you become a teacher: Being a teacher is my challenge job. I love teaching, I love my student’s behavior. They always make me laugh or some time make me loved and sometime make me annoyed. What is the funniest/best story you have about the ETA you work with? 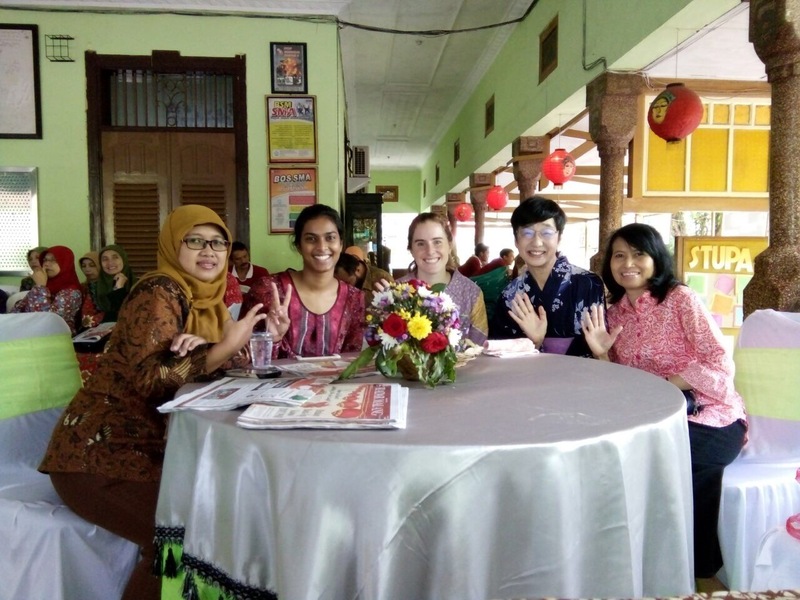 I very appreciated Caroline when she wore “kebaya” for the welcoming party with the exchange students from Thailand. She looks beautiful with traditional Javanese clothes. What is the thing you are most proud of? I am proud to be a teacher. I can meet foreign person like Caroline means that we can share knowledge and experience. I love to be inspiring teacher for my students. 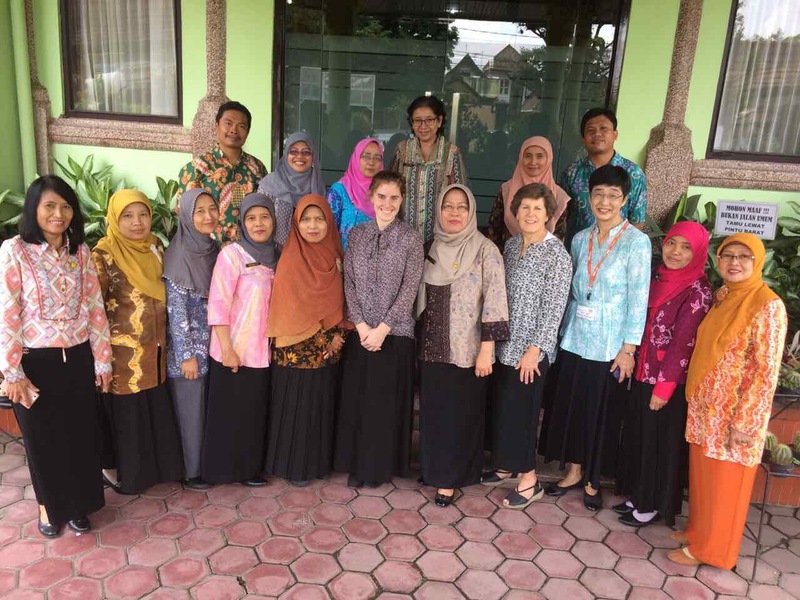 Why did you apply to become an ETA in Indonesia: As an aspiring teacher, I applied to the ETA program to gain teaching experience in a new culture and education system. 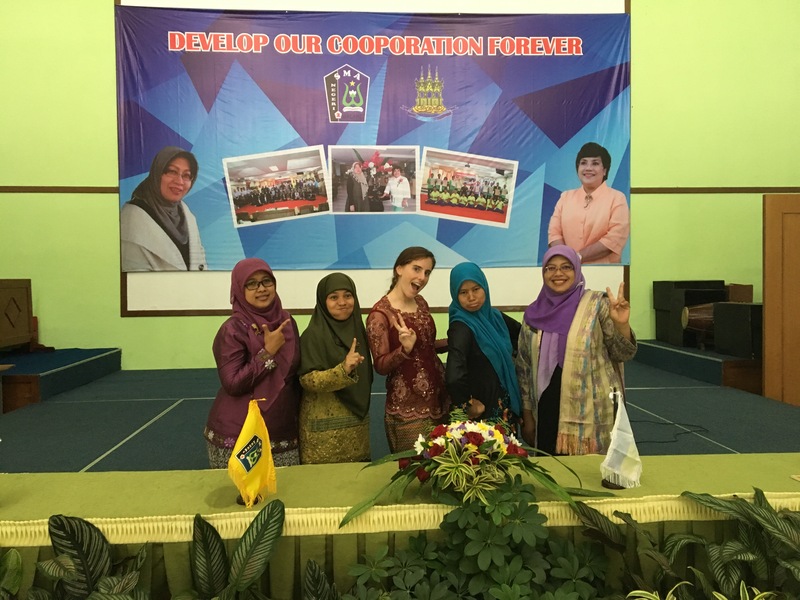 I also chose the ETA program in Indonesia because it provided the opportunity to work with high school students (ETAs in some countries work at universities). And of course, I wanted to come to Indonesia to see its incredible mountains and beaches! What is the funniest/best story you have about the teachers you work with? There are so many! Mostly, I love when I get to “chit chat” or joke with my co-teachers in the teachers room and learn more about their lives. What is the thing you are most proud of? I’m proud of myself for where I am right now! 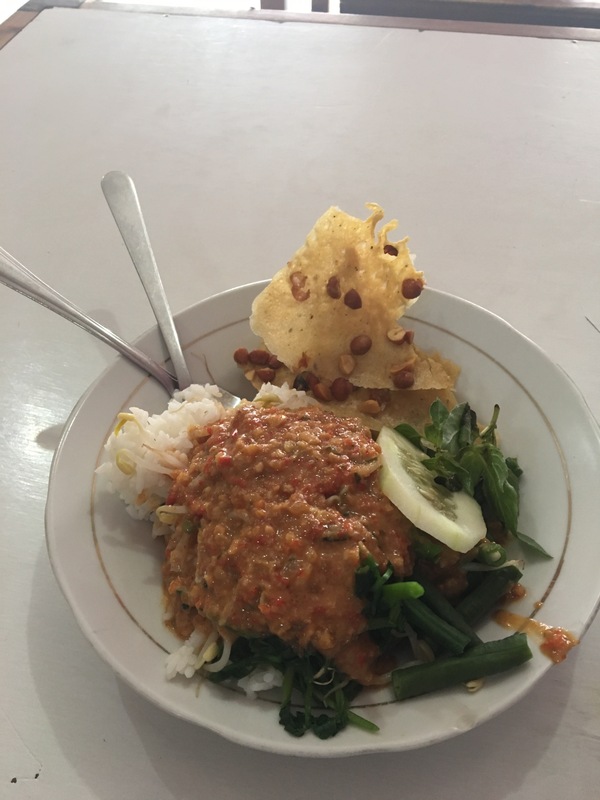 I’ve been living in Indonesia for almost six months, and am still learning new things everyday. One of my favorites! When my mom visited all the teachers and administrators were so kind and welcoming!